Cuenca Los Ojos (CLO) is a private organization dedicated to large-scale restoration of degraded arid and semi-arid ecosystems. Incorporated both in Mexico and in the United States, CLO has land-restoration projects that span 748 square kilometres in the Mexico-U.S. borderlands region. This case study focuses on CLO’s restorative operations on the Mexican side of this increasingly fortified border region. It examines the progress, shortcomings, and challenges of the restoration underway on the 10 000 hectares of Rancho San Bernardino, which abuts the international border in northeastern Sonora. CLO’s achievements over the past 15 years — in controlling erosion, refilling and vegetating deeply incised arroyos, increasing surface and subsurface water, and expanding biodiversity — point to the value of considering the Rancho San Bernardino experiment as a global model. That this experiment has coincided with a prolonged drought also marks it as a model for drylands restoration in the hotter, drier conditions predicted with climate change. Similar large-scale restoration projects might also benefit from a review of CLO’s strategies for fostering cross-border cooperation, building multisectoral alliances among private and governmental participants, restoring transborder wildlife corridors, and creating links between land restoration and emerging restoration economies. The restoration of arid and semi-arid ecosystems merits increased global attention because of their global expanse — constituting at least 40% of the planet’s land surface — and accelerating degradation (Adeel et al., 2005; FAO, 2001; Lal, 2005). But there is no consensus on a clear path forward — in part because of the scarcity of models and in part because of the vigorous debates about restoration and degradation thresholds (Bestelmeyer et al., 2013). When targeted landscapes span fortified international borders or zones characterized by widespread illegal activity, the complexities and challenges of drylands restoration strategies are compounded. A case study of such a situation is described here: Cuenca Los Ojos (CLO) is restoring severely altered riparian areas and aridlands on the Mexico-U.S. border. At a time when the U.S. government is fortifying its southwest border, CLO is advancing an alternative paradigm that advocates restoring transborder ecosystems and generating sustainable cross-border economies. The Cuenca Los Ojos foundation is a nonprofit project created by Valer and Josiah Austin whose institutional mission is “to preserve and restore the biodiversity of the borderland region through land protection, habitat restoration, and wildlife reintroduction”. The Austins moved from New York City in 1983 to begin ranching in southeastern Arizona. The El Coronado Ranch, which is situated on the western flanks of the Chiricahua Mountains in the borderland area, was badly eroded and overgrazed, prompting the Austins to reduce cattle grazing and initiate land-restoration projects. Their restoration strategy primarily involved erosion control and water harvesting techniques on their Arizona ranches, which encompass some 32 000 hectares. Traces of pre-Columbian indigenous communities remain throughout the transborder region in the form of thousands of trincheras (rock check dams), primarily used to increase cultivable land and to ensure year-round supplies of drinking water, while also stemming erosion. Although initially the Austins relied almost exclusively on trincheras for erosion control and water harvesting, over the past fifteen years they have also been erecting larger erosion control structures built with gabions (rock-filled baskets formed by a mesh of galvanized wire). Gabion check dams function like trincheras in trapping water-borne sediment while slowing down the rush of storm water down arroyos and streams. Also like trincheras, gabion dams eventually fade into the landscape as they become covered by alluvium and vegetation. Since the early 1980s, the Austins estimate they have erected more than 40,000 trincheras, earthen berms, and gabions on their U.S. and Mexico properties. Institutionalizing their commitment to land restoration, the Austins founded Cuenca Los Ojos (meaning “basin of springs”) and the civil association Cuenca Los Ojos, A.C. in Mexico. CLO is the institutional instrument to manage their restoration projects and to attract funds to maintain this restoration work. Recognizing that their vision of reviving regional biodiversity and wildlife corridors couldn’t be fully realized without restorative projects south of the border, the Austins purchased Rancho San Bernardino in 1999, and they currently own 42 500 hectares along Mexico’s northern border. CLO has launched its restoration projects in a continental biodiversity hotspot. CLO’s properties encompass all the ecosystems of a region variously described as the Apache Highlands (Marshall et al., 2004) and the Mexican Highlands (Woodward & Durall, 1996). Principal vegetation associations include Chihuahuan desert scrub at 1100 m to pine–oak forests at 2500 m in the Sierra San Luìs (Marshall, 1957). The discontinuous mountain ranges that span the border along the north-south continental divide are known as the Sky Islands or Madrean Archipelago. CLO manages land restoration projects on five ranches in Mexico that form a nearly unbroken 22 km stretch of borderland, extending east from the San Bernardino Valley into the northern outcrops of the Sierra Madre Occidental. These ranches had been heavily grazed since the 1820s with the creation of the San Bernardino Land Grant (C.O. Minckley, 2013) and especially after the beginning of large-scale cattle ranching by Anglo-Americans and fire exclusion in 1870 (Bahre, 1991). Farming in the San Bernardino Valley using water from artesian wells also resulted in the steady encroachment of woody desert shrubs (largely mesquite and creosote) over the largely brush-free grasslands of the ciénaga that historically spanned this transborder ecoregion. Rather than concentrating its resources on restoring and conserving the most biodiversity-rich and scenic of its Mexico properties in the Sierra San Luìs, CLO made the strategic decision to focus its resources on Rancho San Bernardino, which was the most severely degraded of its Mexico borderland ranches (V. Austin, personal communication). 1Rancho San Bernardino sits at the junction of the Sonoran and Chihuahuan Deserts and the Mexican subtropics and the Great Plains grasslands (Spector, 2002). The headwaters or important tributaries of the Río Yaqui pass through Rancho San Bernardino and other CLO’s Mexico properties. The Río Yaqui is the largest river system west of the Continental Divide in northwestern Mexico and flows nearly 400 miles southwest through Sonora, finally emptying into the Sea of Cortez. Rancho San Bernardino provides a valuable opportunity to assess both riparian and grassland restoration. The San Bernardino Ranch and the adjacent San Bernardino National Wildlife Refuge on the north side of the border encompass the uppermost extent of the Río Yaqui watershed, and subsurface pumping of the aquifer is not practised elsewhere in this area. Overgrazing, alfalfa farming, and gravel mining on the ranch and around its perimeter since the late 1880s dramatically degraded the landscape and lowered the water table by as much as 9 m in some sections (R.L. Minckley, 2013; Minckley & Brunelle, 2007). Soon after the Austins purchased Rancho San Bernardino, CLO removed the cattle and began its extensive erosion control projects. CLO’s Rancho San Bernardino restoration project is a natural landscape scale ecological experiment, which aims to return areas that are currently hardpan scrublands to their former status in the mid-1800s as a mosaic of grassland, desert, and riparian habitat (Bahre, 1995; Marrs-Smith, 1983; Humphries, 1987). CLO targeted Rancho San Bernardino for two main reasons: 1, to demonstrate how closely monitored erosion control techniques can restore surface water flows and groundwater reserves even in a landscape sundered by deeply incised channels, and 2, to restore the critical function of the San Bernardino Valley in the sustainability of the Río Yaqui watershed and associated transborder wildlife corridor. The successes, shortcomings, and challenges of the restoration projects on Rancho San Bernardino are instructive for possible future restoration projects in the imperiled desert habitats of the U.S.-Mexico transborder West. This case study can also point to the possibilities of successful cross-border restoration efforts in conflictive drylands regions around the planet. CLO is simultaneously pursing a wide range of restoration techniques on Rancho San Bernardino including the installation of a variety of erosion control structures, cultivation of native grasses for seed, restoration of grasslands through shrub removal and planting native grasses, and fostering biodiversity. CLO is also leading the way forward in Mexico with respect to advocating the use of prescribed burns in sustainable land practices. U.S. Fish and Wildlife Service refuge manager Radke, 2013) reported that, "Grassland restoration is being accomplished through prescribed burning and removal of invasive mesquite trees, providing benefits to resident and migratory wildlife" (p.6). 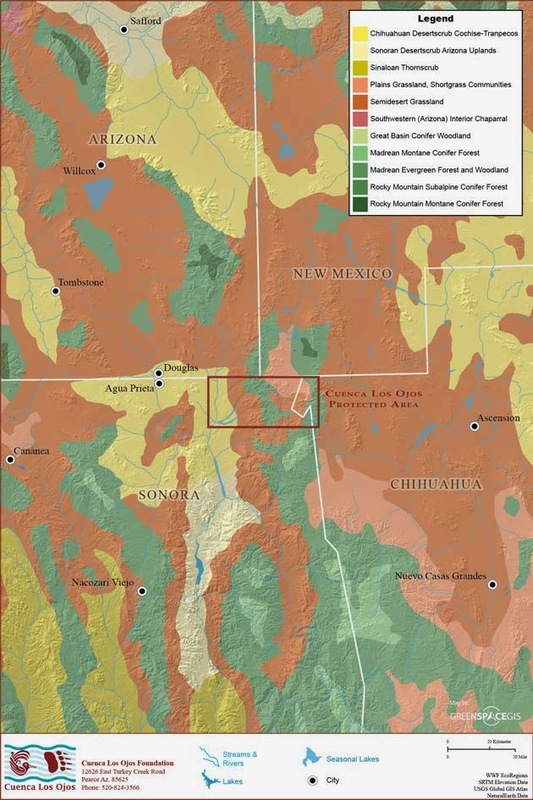 CLO’s primary focus, however, is on restorative strategies intended to facilitate the filtration of water into the soil, thereby recreating a historical landscape characterized by perennial surface flows, a vast cross-border ciénaga, and groundwater that can be tapped by native desert grasses. Valer Austin, who directs CLO’s restoration efforts in Mexico, has relied primarily on empirical knowledge gained by fifteen years of erosion control and water-harvesting efforts on the Austins’ ranches north of the border. The restoration techniques on Rancho San Bernardino have also been informed by close observation of the conservation and restoration practices on the two USFWS refuges that adjoin CLO properties. On a February 6, 2012 visit to CLO’s Mexico ranches, Valer Austin stresses that the key to successful land restoration is the acquired ability to “read the land” and observe how humans and forces of nature have altered the landscape. This empiricism also includes “an unwavering determination to get sustainable land management right, and to be constantly learning from your mistakes” (V. Austin, personal communication). CLO, however, is committed to the scientific evaluation of its restoration projects, and has collaborated with scores of researchers and scholars from U.S. and Mexican institutions. In its mission statement, CLO stresses its commitment to “scientific research and sustainable resource management techniques”, and it has hosted more than 100 researchers at its ranch headquarters. Rancho San Bernardino is becoming a focal point of research about the drylands restoration, including the effectiveness of gabion dams. The erection of erosion control structures has a long history marked by many failures (Peterson & Hadley, 1960; Peterson & Branson, 1962), and some environmental experts warn that check dams and gabions should have no place in stream and land restoration, noting that extreme weather events regularly destroy well-intentioned erosion control structures, resulting in greater flood damage (Zeedyk & Clothier, 2012). There is no playbook of large-scale drylands restoration that CLO could depend on to guide much of its work, especially with respect to erosion control and aggradation of deeply incised channels. Gabion dams on Rancho San Bernardino are constructed in incised channels that are on average six metres deep and can be as wide as 100 metres. Erosion control structures also include earthen berms as wide as 900 metres, and cement spillways with reservoirs. Research to develop detailed topographic surveys using terrestrial and airborne laser detection and remote sensing, coupled with hydrological modeling, field observation, and stream-flow sensors is providing data on the impacts of restoration efforts on sediment and hydrology (Delong & Henderson, 2012; Henderson & DeLong, 2012; Jemison et al., 2012). Remote sensing monitoring by the U.S. Geological Survey of Rancho San Bernardino shows vegetation growth around gabions and berms despite documented drought. Comparing gabions used for urban flood control in the Mexican border city of Nogales with those at San Bernardino, researchers with the U.S. Geological Survey and the University of Arizona posited that the success or failure of gabion structures is closely related to the goals of installation, noting that the gabion dams on Rancho San Bernardino were constructed for riparian restoration not flood control (Gass et al., 2013). USGS members observed that a combination of restorative practices “has successfully restored ecosystem function to riparian corridors in this once lost, but not forgotten cieñega wetlands” (L. Norman, personal communication, March 2014). Despite the drought — including the declining winter precipitation in the Chiricahua Mountains — water is returning to this degraded landscape (Broska, 2009). In large part, the reduction of the erosive scouring of the landscape during extreme rain events during the monsoon seasons is increasing the availability of seasonal and permanent water (Radke, 2013). When hosting a delegation of some twenty visiting ranchers from neighboring Chihuahua at the San Bernardino Ranch on October 12, 2013, Valer Austin explained that the end objective of the gabions and trincheras was not to collect surface water but rather to restore a landscape that absorbs rather than sheds water — “to function like a sponge” (V. Austin, personal communication). Among the signature achievements of CLO and the Rancho San Bernardino restoration project is the recolonizing of the upstream and downstream wetlands with native fish without the need for active reintroduction projects (Radke, 2013). Surveys during 2008-2011 documented the presence of six of the eight Río Yaqui native fishes in the San Bernardino Creek, pointing to the success of CLO’s restoration work in slowing erosion, raising groundwater levels, and giving rise to dense stands of cattail and bulrush along the once barren creek (C.O. Minckley, 2013). Researchers from the Universidad de Sonora have documented the increasing biodiversity on Rancho San Bernardino as part of a plan to have the ranch designated as a privately owned wildlife reserve. The researchers concluded that the “huge change” at the ranch — which has a “history of agriculture and livestock exploitation beyond the capacity of recovery” — in the retention of sediment and water has resulted in the attraction of many diverse species of mammals and birds. Monitoring over short periods documented the presence of 85 bird species (Cárdenas-García & Olguín-Villa, 2013) and 26 species of mammals (Bonillas-Monge & Valdez-Coronel, 2013). The impact of livestock on the aridlands of this transborder region is a subject of debate amongst environmentalists, government agencies, and the ranching community. To a large degree, this debate is about differing philosophies and priorities. Environmentalists who prioritise biodiversity and the restoration of natural habitats generally oppose grazing cattle on public lands and in stressed ecosystems (Brown & McDonald, 1995). Others, including sectors of the environmentalist community, argue that livestock can play a critical role in maintaining and restoring healthy desert grasslands, especially when ranchers adopt holistic range management techniques (Schwartz, 2013). The “Working Wilderness” slogan of the Malpai Borderlands Group (Sayre, 2005) is emblematic of a highly contested land-management philosophy positing that healthy open landscapes depend on livestock grazing by spreading seed, making soil more permeable to water, and keeping grasses trimmed and growing. Recent research about land conditions subsequent to cattle removal in sections of the San Bernardino Valley helps inform this discussion (R.L. Minckley, 2013). For the past three centuries, livestock have been a constant feature on this arid and semi-arid landscape. The removal of cattle by USFWS in the early 1980s in the newly created San Bernardino refuge and across the border by CLO in 1999 presented Robert Minckley with the opportunity to study the impact of cattle on the spectrum — riparian, grassland, and desert shrub — of desert habitats in the San Bernardino Valley. As might be expected, the comparative survey found that vegetation responds rapidly to reduced grazing or no grazing in areas with surface water, leading to habitats “with great vertical development not previously found or barely present in grazed areas” (ibid. : 321). Minckley noted that in the areas of the refuge and CLO’s Rancho San Bernardino with water “the capture of carbon in thick tree trunks is greatly increased, and the litterfall and carbon addition to soils and watercourses is increased manifold” (ibid. : 321). CLO has increasingly insisted that sustainability strategies must extend beyond a narrow focus on land protection. Conservation and restoration efforts should “address the environmental, social and economic challenges of the region in a strategic and integrated fashion” (CLO, 2008: 2) Furthermore, “The area needs to be protected as a wildlife corridor…. [But] the border region should also be an area of rich cultural exchange between people of two nations. Instead it has become a zone of contention.” CLO says that it “hopes that this effort would be seen as an alternative to the many top-down, security-driven actions being implemented by the U.S. government on the border at great cost to local communities, the environment, and cross-border cooperation” (ibid. : 3). As the land heals from overgrazing and interventionist restorative techniques, CLO is reaching out to its Sonoran and Chihuahua neighbors with proposals to participate in Borderlands Restoration, a CLO partner, terms “community-based collaborative” land restoration” (Pulliam, nd). These collaborative initiatives include a partnership with Don Cuco Sotol, which produces and markets sotol liquor. CLO invited the family enterprise with an international market to harvest fleshy hearts of the agave-like sotol plant in the Sierra San Luìs. In return, the family has agreed to take measures to ensure that the natural rates of sotol growth are maintained. CLO is also cultivating native grasses and experimenting with seed harvesting with the intention of fostering a social enterprise that markets these native grass seeds — which currently are only available from U.S. distributors. CLO, working closely with Borderlands Restoration L3C, is also exploring plans to cultivate and distribute desert plants that attract hummingbirds and other pollinators such as bees, butterflies, moths, and bats — all of which have experienced habitat loss as a result of desertification. Another hopeful sign that a restoration economy is emerging can be found south of Rancho San Bernardino in the Ejido 18 de Agosto. During a November 21, 2012 visit, ejido representative Marcelino Alfaro and other community members recounted in personal communication how the ejidatarios initially opposed CLO’s restoration project, fearing that CLO’s restoration projects were capturing scarce water, thus further limiting their own access to surface and subsurface water. Today, however, the ejidatarios are erecting their own trincheras and gabions, while reporting that the Río San Bernardino is once again running year-round through their land and well levels have stabilized or risen despite the record-breaking drought. The restoration initiatives of CLO are part of an emerging and evolving framework of collaboration and governance involving public and private actors on both sides of the border. On the U.S. side, the most influential private participants in the emerging governance are CLO, The Nature Conservancy, Sky Island Alliance, Borderlands Restoration, Animas Foundation, and the Malpai Borderlands Group. Many of the ranchers associated with the Malpai Borderlands Group sign “conservation easements” in which private foundations compensate the ranchers for the development potential of their ranch, thus giving them an incentive to maintain their ranching lifestyle, not sell their land, and keep the rangeland from being subdivided (Sayre, 2005). Working closely with these private groups are U.S. and state agencies that are major stakeholders in the region such as the U.S. Geological Survey, Natural Resources and Conservation Service, U.S. Fish and Wildlife Service, Bureau of Land Management, and Arizona Game and Fish Department. On the Mexican side, since the late 1990s CLO has broken new ground in establishing working agreements and forging common restoration agendas with an impressive array of local, state, and federal agencies, including Secretariat of Environment and Natural Resources (Semarnat) National Forest Commission, National Ecology Institute, National Commission for Protected Areas, among others, and winning Mexican governmental and university awards in the process. With respect to advancing its vision for restoring the entire Río Yaqui and Sierra Madre Occidental wildlife corridor, CLO also works closely with the Mexican NGOs Pro-Natura and Naturalia, both of which have established nature refuges along the western flanks of the Sierra Madre Occidental in Sonora. Ranchers from the region now visit Rancho San Bernardino to learn about CLO’s erosion control and grassland restoration projects and methodologies. As CLO is drawing increased national and international attention because of its cutting-edge on the San Bernardino ranch, discussion is turning to the many unanswered questions about drylands restoration and to the challenges of maintaining and expanding CLO’s work. Two unanswered questions raised by the Rancho San Bernardino experiment are: What is the relationship between increased surface water on the ranch and groundwater levels, and by extension to the regeneration of the desert grasslands? Can restorative techniques endurably replace deeply rooted woody desert shrubs with native grasses, and would such a project pass a cost-benefit evaluation? There are also pressing questions about cattle and the restoration of aridlands. If the principal goal of large-scale restoration of desert landscapes is to restore entire ecosystems and associated wildlife corridors, what role, if any, do livestock have in contributing to this goal? A more practical question faced by ranchers and land managers is whether the livestock industry is economically sustainable as surface and subsurface water diminishes, droughts persist, and temperatures rise. Although the impressive results at Rancho San Bernardino (and on other CLO properties) have made it a model of large-scale restoration of arid and semi-arid landscapes, there are many challenges in sustaining this model, growing it, and replicating it in other regions. These challenges largely revolve around questions about political will, institutional frameworks, and finances. For the most part, the successes (and shortcomings) of the experiment are almost wholly dependent on the vision, determination, and economic resources of the CLO principals. Can governmental and nongovernmental entities overcome the border divide and create cross-border frameworks and funding mechanisms for maintaining CLO restoration projects well into the future? Can Rancho San Bernardino serve as a pilot project for an ecoregion-wide restoration strategy with diverse biodiversity, carbon sequestration, and sustainable economy goals? If so, what would be the governance frameworks and funding sources for this transborder land restoration? Can transborder collaboration on land restoration and on building restoration economies supplant border security as a more constructive borderlands paradigm? Most casual observers of degraded arid and semi-arid landscapes in the southwestern United States and northwestern Mexico dismiss these drylands as “badlands” or wastelands with little ecological or economic worth. A visit to the San Bernardino Valley — and especially to the land restoration projects of CLO and the neighboring USFWS refuges – would surely alter that impression. Monitoring of these projects by scores of scientists and scholars is also creating a new body of knowledge and literature on drylands restoration that will prove valuable to other large-scale drylands restoration projects around the globe.